Welcome To Joan's Maui Condos. in South Maui at Kihei Akahi Resort. Wailea Ekahi Ocean Front Village. Located right on Keawakapu Beach. SPECTACULAR OCEAN AND SUNSET VIEWS. DIRECT FROM OWNER AT REASONABLE RATES. We are the proud owners of a Studio Condo and a One Bedroom Condo in Building 16, with ocean views down the greenbelt at Wailea Ekahi Village. We also have a Studio Condo and One Bedroom Condo in Building 9, on the Greenbelt and just 200 feet from the Oceanfront Pool and Pavilion. Ekahi Village is a Beach Front Resort spread over 35 acres right on Keawakapu Beach. At Kihei Akahi we own two one-bedroom Vacation Rental Condos and one two-bedroom Condo Rental at the popular Kihei Akahi Resort. All of our condominiums, on the 5th and 6th floors, have ocean views and are in quiet locations away from elevator noises. We take great pride in our Privately Owned Maui Condos and maintain them with the same standards that we would expect in a vacation condo. Because of these high standards in both cleanliness and aesthetic appeal, we have had a very strong following for many years. 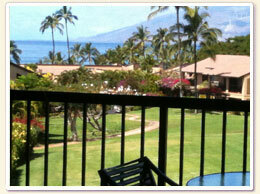 Our Maui Condominium Rentals are meticulously maintained, have fantastic views, and are "Truly a Home Away From Home". 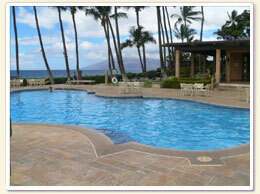 We can offer a Maui Accommodation for rent that will be perfect for your needs. Check out our Testimonials page and read what guests have to say about our condos. 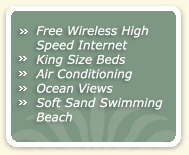 Located in South Kihei, just off the edge of Wailea Resort area. 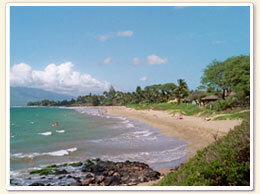 This area is one of Maui's most popular and is noted for its excellent soft sand swimming beaches. Enjoy swimming, snorkeling or whale watching on these World Class Beaches. Noted for its lush vegetation with many blooming flowers, Kihei Akahi Resort has Two Pools, a Free Tennis Court, B-B-Qs and Refrigerator around the pools. The Wailea Ekahi Oceanfront Village, set on 35 beautiful landscaped acres, is located at the end of a beautiful 1/2 mile long Keawakapu beach. Local surfing is 5 minutes from Ekahi Village. At the water's edge is our main pool alongside the beachfront pavilion where you can host barbecue parties or just relax in the cool shade. 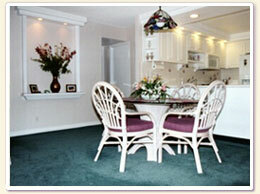 A complete kitchen with refrigerators is there for your use if you'd like to dine beach side or have a party. There are three other (quiet) pools nestled throughout the village if you prefer a little more tranquility. All of our Ekahi Village units are located on the Greenbelt, away from the road. 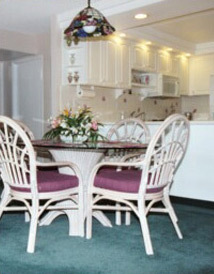 They have beautiful Ocean and Sunset Views, as well as Tropical Views down the greenbelt. 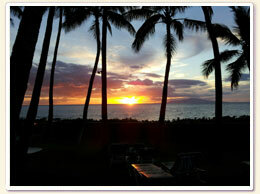 Wailea Sunsets are world renowned. Enjoy these beautiful sunsets as you relax and dine on your own private lanai or while taking a romantic walk on the beach. Known for its "Sunshine" is the driest spot on the Hawaiian Islands with an average annual rainfall is less than 10 inches. 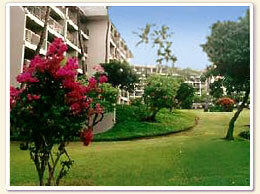 It is a quiet and peaceful area with the five-star hotels of Wailea. Several shopping centers including the Shops of Wailea, with both casual and fine dining restaurants, are within walking distance. If you are a golfer, some of Maui's best golf courses can be found in the Wailea and Makena area. Maui has been voted "Best Island" and once you visit, you will know why. Its beaches, volcanic mountains and craters, lush vegetation, fine restaurants, golf courses, snorkeling and Aloha Spirit are "The Best". We first experienced Maui more than twenty years ago and fell in love with it. We have been returning to Maui several times every year since our first visit. Try Joan's Maui Condos for the BEST Maui Condos By Owner and Maui Condos For Rent at Kihei Akahi and Wailea Ekahi Village.